These numbers are calculated based on the assumption detailed in the nutrient removal matrix Click here. Provided as a guide only. Welcome to Rural Liquid Fertilisers (RLF) and Maxiyield. The information that this webpage contains will transform the way in which you view your cropping or growing enterprise. Maxiyield can give you all the information that you need to transition to a 'modern-farming future'. A future that assures improved quality and increased yield for your crops, and greater financial rewards for your business. Maxiyield is a calculation tool and interactive resource that enables you to define, (and refine), your fertiliser needs very carefully and very specifically to suit your own cropping environment and crop choices. Compare the OLD practice with the NEW practice of IFM. The following graphic shows how this process works. IFM is a powerful tool for the modern-day farmer who wants to improve not only his crop's potential today, but who wants to protect his land's potential for the future. 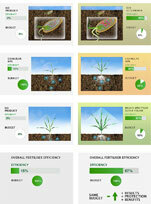 Crop quality and yield is becoming increasingly more important for markets all over the world. As the world population grows, and the viability of some agricultural lands decreases with overuse or over-management, modern-day farming strategies such as IFM are relied upon to deliver more positive and measurable outcomes. technical or plant problem or question that you have. chemical or compatibility question that you have. Copyright © 2013 RLF Global All rights reserved.